Welcome to the Advanced Workshop on Content Computing 2004. The focus of this workshop was "Content Computing." It emphasized research areas that facilitate e?cient, appropriate dissemination of content to users with the nec- saryaccessrights. Weusetheword"content"insteadof"information"or"data"
Welcome to the Advanced Workshop on Content Computing 2004. The focus of this workshop was "Content Computing." It emphasized research areas that facilitate e?cient, appropriate dissemination of content to users with the nec- saryaccessrights. Weusetheword"content"insteadof"information"or"data" because we want to cover not only raw data but also presentation quality. The fast growth of the Internet has already made it the key infrastructure for informationdissemination, education, business andentertainment. While the client-server model has been the most widely adopted paradigm for the WWW, thedesiretoprovidemorevalue-addedservicesinthedeliverylayerhasledtothe concept of an active network, where content-driven, intelligent computation will be performed to provide quality-of-service for content presentation and best-'t client demand. These value-added services typically aim to enhance information security, provide pervasive Internet access, and improve application robustness, system/networkperformance, knowledgeextraction, etc. Theyarerealizedby- corporatingsophisticatedmechanisms atthe deliverylayer, which is transparent to the content providers and Web surfers. 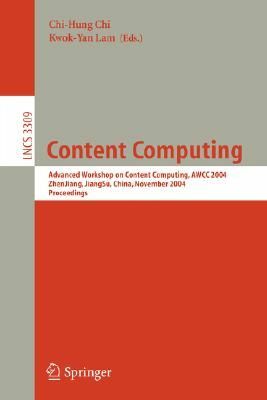 Consequently, the notion of "Content Computing" has emerged. Content computing is a new paradigm for coordin- ing distributed systems and intelligent networks, based on a peer-to-peer model and with value-added processing of the application-speci?c contents at the - livery layer. This paradigm is especially useful to pervasive lightweight client devices such as mobile and portable end-user terminals with a wide variation of hardware/software con?gurations. This year, the workshop was held in Zhenjiang, Jiangsu, China. We received 194 high-quality papers from 11 regions, namely PR China, Korea, Singapore, Japan, United States, Canada, Australia, Germany, Taiwan, Italy, and Hong Kong. Totally, 62 papers were accepted and presented in the workshop.